NASCAR fans flock to Daytona International Speedway on the last Sunday in February for the Daytona 500, considered the most prestigious stock car race in the world. The race is 500 miles, which requires 200 laps around the 2.5-mile Daytona International Speedway loop. An entire tourism industry has built up around the Daytona 500 by virtue of the fact that it takes place in Florida in February. Played at the Augusta National Golf Club since 1933, the Masters golf tournament is one of the most important men's professional golfing championships. Played during the first week of April, the Masters signals the first gasp of summer for golfers and golf enthusiasts. The winner of the Masters traditionally receives a green jacket to wear following his victory. Note that the Masters tournament is as competitive off the course as it is on. Potential spectators must begin applying for Masters tickets as early as 11 months in advance. Held every year on Patriots' Day—the third Monday of April—since 1897, the Boston Marathon is the world's oldest annual marathon race. The race attracts top male and female runners from across the world but is also open to amateurs. The 100th running of the Boston Marathon set a world record for the number of participants, which included 38,708 entrants, 36,748 starters, and 35,868 finishers. In addition to the many runners, the race also sees as many as 500,000 spectators line the route, which meanders past many of Boston's top attractions. 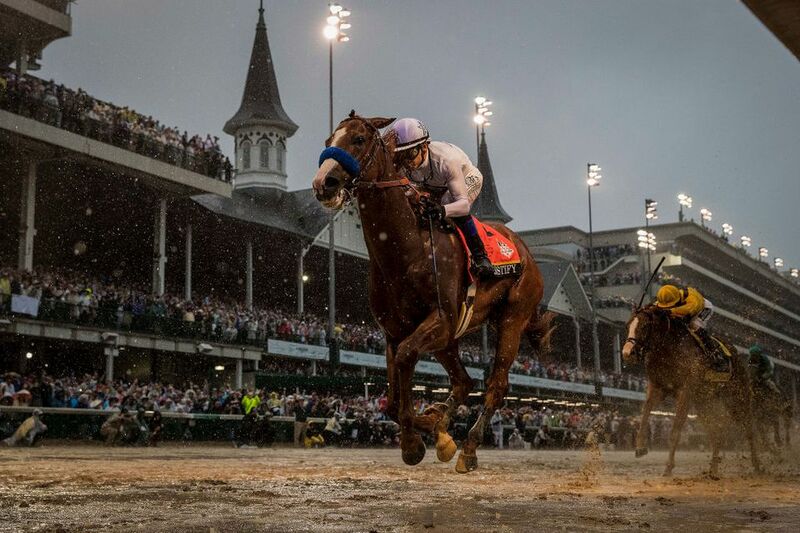 The Kentucky Derby, the Preakness Stakes, and the Belmont Stakes make up the three horse races of the Triple Crown. In order to win the "Triple Crown," a horse must win all three races. This has only happened 12 times in history; the last time was in 2015. The first and most illustrious of the races is the Kentucky Derby, which takes place on the first Saturday in May at Churchill Downs in Louisville, Kentucky. The Preakness Stakes is held in Baltimore, Maryland at the Pimlico Racetrack on the third Saturday in May. Belmont Park in Elmont, New York, hosts the Belmont Stakes, which takes place three weeks after the Preakness and five weeks after the Kentucky Derby. With permanent seating capacity for 257,000 fans, the Indianapolis Motor Speedway, in Indianapolis, Indiana, is the largest spectator sporting facility in the world and hosts one of car racing's most famous races—the Indianapolis 500. The Indy 500 takes place on Memorial Day Weekend each year and features 33 starting IndyCars racing around a 2.5-mile oval circuit for 200 laps. The winner typically drinks milk after his victory and collects one of the single biggest monetary prizes in sports, around $2.5 million or more. While the route changes yearly, the one week, 750-mile AmGen Tour of California is your best chance to see world-class cyclists riding through the cities and along the coasts of California. The Tour of California doesn't have a long history, going on only since 2006, but it has begun to attract thousands of cycling spectators who may have otherwise traveled to Europe for the Tour de France or the Giro d'Italia. A chance to see some of the world's top surfers ride impossible waves is what the U.S. Open of Surfing in Huntington, Beach, California, is all about. Each year, hundreds of thousands of sun and surf lovers gather on 14 acres of beachfront south of the Huntington Beach pier to watch professional men and women surfers compete for bragging rights and a purse of up to $310,000. The surfing tournament has blossomed over the years to include competitions for skateboarders and BMX riders and spectators will also find music, vendors, and tons of California-style fun. The final Grand Slam tennis tournament of the season, the U.S. Open is played on the hard courts at Flushing Meadows-Corona Park, in Queens, New York. The finals of the U.S. Open take place on the central court, named Arthur Ashe Stadium, after the American tennis great. But your best chance to see some of the biggest stars in men's and women's professional tennis is early on in the tournament when matches are played at the various, more intimate satellite courts of Flushing Meadows. The two-week tournament takes place at the end of August/beginning of September with the Labor Day weekend falling in the middle of the tournament, making it an ideal sporting event around which to plan a visit to New York City. Although not as old as the Boston Marathon, the New York City Marathon is one of the most popular running races in the world, attracting annually approximately 35,000 runners. One of the biggest draws for participants in the NYC Marathon is the chance to run across or past icons of the Manhattan cityscape and through all five boroughs. Spectators get a thrill from watching the runners, too.